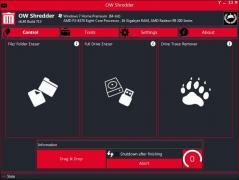 OW Shredder is a reliable application that lets you permanently erase data from your computer, regardless if we’re talking about files, folders or entire system partitions. Also, it can remove all traces of data from blank storage space. The utility has a practical UI that can be easily used by anyone. In the main window, you can select the function you want to use simply by dragging and dropping items onto it. You can opt between File/Folder Eraser, Full Drive Eraser or Drive Trace Remover. After you drag and drop the source items into OW Shredder’s window, it will display them in a dedicated field. Then you can simply click on the Erase All button to remove them from your computer. In the Settings menu you can choose from four different algorithms that can be used to permanently delete data: British HMG Baseline, GOST R 50739-95, HSC 1614.65 or RCMP TSSIT OPS-II. QIF2CSV - Open .QIF Files Easily! A shield agains vulnerability exploits.